Day already co-owned and managed two ranches, so the last thing he needed was yet another ranch. But when he saw the lush grasses and broad expanses of the 35,000-acre Arnold Ranch in South Dakota, he fell for its charms and purchased it. When he met Dayton Hyde, rancher and mustang preservationist, a wild scheme was hatched—maybe they could use the new ranch as a mustang sanctuary. The U.S. Bureau of Land Management had thousands of unadoptable mustangs warehoused in corrals, and if the bureau could be persuaded that caring for these horses on a ranch would not only be cheaper but better for the horses, then it would be a winning situation all the way around. If you enjoy Cowboy adventure and are hooked on the west, you will thoroughly enjoy Randall’s series of Pardner’s Trust. 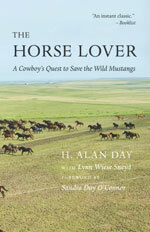 This is an engaging story of a young cowboy, a betrayed beautiful horse and the west. Ricky Richardson, following his love of livestock and cowboying, finds his niche at a feed lot in Clovis, New Mexico. His untiring work ethic and willingness to learn put him in good stead with Jim, a seasoned cowhand who shares a lifetime of experiences with the young man. A turn of bad luck forces Ricky to buy the only horse he can afford, a neglected black gelding, so he can take a ranch job that requires him to have a good using horse. How useable this horse is, is questionable as he has lost all faith in humanity. You will love how the bond between the two develops and how Ricky handles life and the challenges that go with it. You’ll be there when the horse earns the name of Pardner. You won’t find pages full of foul language and violence with this series, instead you will find yourself drawn into a story of people and animals you wish you could meet. 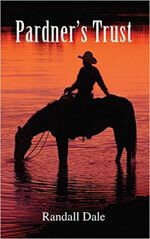 You might want to pick up the sequel, Pardner’s Trust, Book 2, Friends Indeed, when you buy Cowboy Up. It’s a non-stop reading experience. Two thumbs up for Randall Dale, a real-life cowboy, for providing such an enjoyable reading adventure. This book is available for your kindle. I love true stories, especially when they involve horses or dogs and are full of courage, integrity, passion and, best of all, a happy ending. 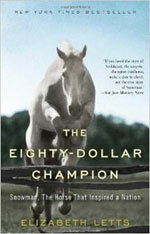 Having been horse-crazy all of my life, I remember the story of Snowman, the Horse That Inspired a Nation, from my childhood; and was thrilled to see the story preserved in print. It’s a bit of a tossup as to who is the real hero in this story. Without the perceptive trainer, Harry de Leyer, the horse, Snowman, would never have had the opportunity to achieve his full potential and without Snowman, Harry might have remained just a good instructor/ trainer with a big dream. This is a story of a rather ordinary looking horse already on the killer truck destined to his demise, being rescued by a Dutch immigrant horse trainer. Harry could see a spark in Snowman’s eye that beckoned him to invest his last $80.00 to give this poor animal a chance at life. Snowman became an excellent school horse for Harry and his students at the Knox School. However, at the end of the school year, Harry decided to sell Snowman to make room for a more elite jumping candidate. Harry’s dream was to win the Madison Square Garden Open Jumping Division and he certainly couldn’t do it on a plow horse. It was after this separation that Snowman’s uncanny aptitude for clearing very high fences became apparent. No fence could keep Snowman from running away from his new home to return to Harry. Soon Harry bought Snowman back and the two of them started their quest for a championship that belonged to them. This is a story of unstoppable hope, inconceivable dreams and the chance to have it all. Elizabeth Letts’ message is simple: Never give up, even when the obstacles seem sky-high. There is something extraordinary in all of us. This is a story that will appeal to everyone. Happy reading. Hope you can finish the book before seeing the movie.